I have been using water makers for over 30 years now and have learned a lot on what works and what doesn’t. First of all a plankton filter is usually a small screen filter that is easily cleaned. This is normally in line right after your water intake to the system. Next item in line is your pre-filter, which in the case of your setup are the large PVC canisters that hold the very expensive 5 micron filters that you can only get from Sea Recovery. The charcoal and ph filters are for product water that comes out of the membranes before going to the water tank. We have chosen to add the Sea Recovery Media Filter system, which is nothing more than a pool filter, and it contains sand and gravel to filter down to 30 microns. As you can see, you still need a 5 micron filter before pumping salt water into the membranes. I forgot that we have eliminated the oil/water separator, as we have found there isn’t any oil in the water at the depth we draw water into the boat. As you can see in our pictures we only have the media filter and next in line is the pre-filter housing. Tips on making water include only making water in good clean areas. If in a harbor only make water on incoming tides. Normally we try to only make water when cruising, as that’s where the cleanest water is. The plankton in Canada and Alaska is bad at times, but if you use good procedures for making water your pre-filters will last a long time. Usually one season or year. So far we have over 150 hours on our unit. We back flush our media filter more often than necessary, but it insures we are getting good clean water to the pre-filters. In Canada and Alaska you might need to back flush the media filter once every 10 hours of operation, whereas in Fiji we never had to back flush. 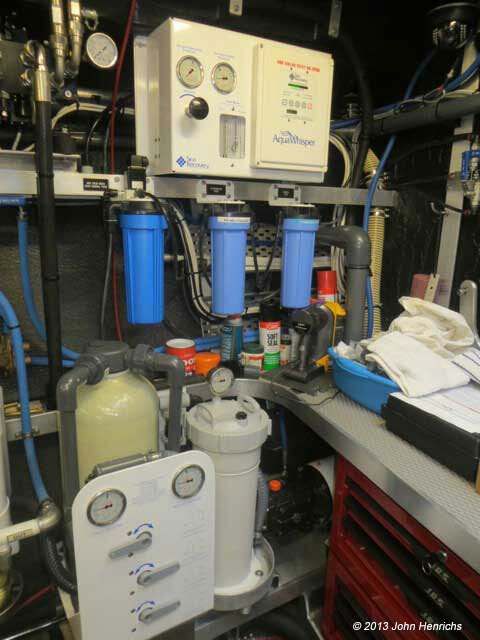 So far we are still on our first pre-filter and will change it before our next passage to Tonga. I think Circa gave us 4 or 6 which will last that many years. The media filter made by Sea Recovery is one of the best I have found, because of the valves and gauges for back flushing and cleaning. Very simple and not too expensive. The cost of the Media Filter is about $800 plus cost of installation. 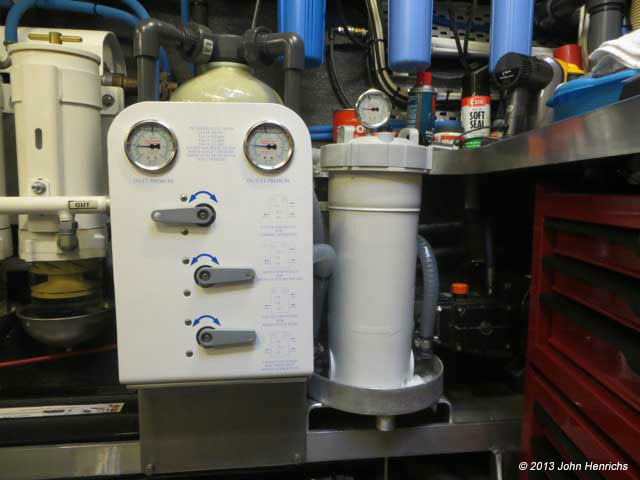 Remember that the water entering the membranes must be filtered down to 5 microns and so the pre-filters are necessary. So far we have over 150 hours on the system and it has functioned flawlessly. As I have indicated we only get water maker water from the aft water tank, and continually check the quality of our product water coming out of the water maker. We have a small water tester and keep track of the parts per million of our water. The first indication of your membranes getting old or worn out is that the salinity numbers will start to increase fairly rapidly, and you will know it’s time for replacement. I have changed them myself and it’s not a big job. Checked the water yesterday and we are making about 130 parts per million, which is very good quality. The last set of membranes we replaced had over 700 hours and were 6 years old. We never pickle and always do a fresh water flush at least once a week when not using the water maker. If we were going to lay the boat up for a long period of time, I might consider pickling the membranes, but would prefer keeping fresh water flowing through them as much as possible. Our original pre-filter is still in good shape, but we will change it out due to time and not because of being clogged up. This is my 6th Sea Recovery water maker system and have been pleased with each one. Another point I haven’t mentioned is that during start up, as I increase pressure, I never let the product water flow get above rated amount for the unit. In our case it is 58 gallons/hr. With a fresh water flush, the output of the unit will go up to rated output with just a little pressure, and as the fresh water is flushed out of the membranes, you will have to increase pressure to keep the output up to the rated amount. I know it’s not recommended, but we never go over 800psi and before shutdown we always reduce the pressure to zero to take the load off the membranes. I don’t know how much this helps the life of the membranes, but we have been able to exceed the normal life of our membranes on each unit we have had installed. *John wished to acknowledge the assistance of Circa head engineer Ian Tibby for making this added filter fit nicely into the engine room of the FPB 64-5 Tiger. This entry was posted on Thursday, February 21st, 2013 at 8:00 pm and is filed under Cruiser's Tech Talk. Both comments and pings are currently closed.